Thanks for the comments on the pies over the weekend. I've chosen three pies as finalists and will be baking them for my family over the next several days. It was very hard to choose the three, I would really like to bake several more but there actually is a limit on pies that this household can consume in a week. So last week I was experimenting with Scottish tablet. 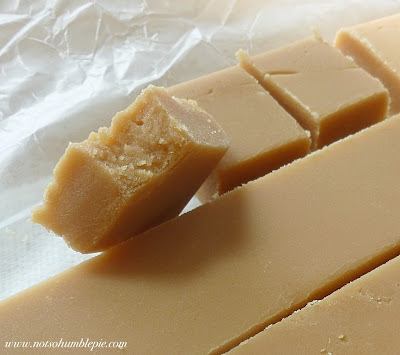 I tried this slightly grainy butterscotch fudge-like confection in Edinburgh last month. I really liked it, so I bought a small bag and took it home to recreate in my own kitchen. I figured since the candy was a bit grainy it would be easy to produce. As I learned from following a few Scottish tablet recipes, bad overly gritty tablet is easy to make. Making tablet where the texture is just right, isn't so simple. Apparently tablet, like almost every other homemade candy requires a lot of care and special attention. Scottish tablet recipes vary little in terms of ingredients but the instructions for making the tablet is often really vague (as far as candy making goes). Don't worry, I'll do better than this below. Rather than just blindly trying new recipes I tried to apply a little logic and fix the recipe and method so that I could recreate my Edinburgh tablet. After all, testing tablet recipes could burn through a 50lb bag of sugar very, very quickly. My initial problems with crystallization were due to a wealth of seed crystals no doubt lurking in my first batch. The recipes I had didn't provide adequate moisture to dissolve the sugar before it started to caramelize. So naturally, I decided to use more liquid. The recipes didn't call for standard candy making practices, like washing down the sides of the pot, etc. At first I assumed this was because of the desired grit in the confection, so I gave it a shot. Now I know better. I decided I would cook this candy like I would any other crystallization prone candy. I wanted to further inhibit crystallization. Tablet traditionally relies on fat to act as its interfering agent. Calling for glucose or corn syrup would probably be sacrilegious here, so I decided to up the fat content adding additional fat--and rich flavor--in the form of heavy cream. I gathered from all the recipes calling for beating the candy by hand after cooking, that is where crystallization should take place. You can create crystals just by agitating a sugar solution. This is why many of my candy recipes call for you to stop stirring after a certain point. So I was going to aim for a mixture with no seed crystals and then hope agitation alone can give me the appropriate degree of crystallization. So with a new recipe and a new set of procedures, I hit the kitchen. To my humble reader, Sleepwalker, who asked about tablet a few months ago. Hopefully you have better luck with my recipe and instructions. One VERY large heavy bottom pot. I prefer to use my large non-stick 8qt stock pot for this recipe. The initial mixture may not look like much but it will easily double in volume, so plan accordingly. I also prefer to use non-stick for moderate temperature making candy as it is the easiest to wash down and the candy doesn't stick to the sides and bottom and this helps prevent crystallization. You will also need a long handled wooden spoon and a candy thermometer, unless you're proficient with the cold water test. Also have a pastry brush and cup of water handy so you can wash down the sides of the pan. Grease a 13"x8" pan with a little butter or non-stick spray. To begin, combine the sugar, butter, heavy cream and milk over medium low heat. Stir constantly with a wooden spoon, remove any sugar crystals or splatters from the sides of your pan with the damp pastry brush (do this throughout the entire process) and slowly bring to a boil. This will take a while (10 minutes) and you will be tempted to turn up the heat, please don't. Rushing candy making is a surefire way to get bad results. Once the mixture is boiling and the sugar has completely dissolved--you can double check this by dipping a teaspoon into the mixture, let it cool and then rub the syrup between your fingers. If you can detect no grit in the syrup you're good to go--you can add the condensed milk. Once you get it to a boil, stir and allow to simmer for a minute. You want to make sure you've dissolved all that sugar. Bring the mixture back to a boil over medium-low heat. The mixture will begin to increase in volume and turn a blond color. You can stop stirring now. Take your wooden spoon over to the sink and run it under some cold water to cool. Wash the spoon as it will probably be gritty from the first stage of this recipe. Set the spoon aside. Use it occasionally to stir the mixture gently to make sure it is caramelizing evenly and to scrape any build up around the edge of the pot. Cooking away. Note the immaculately clean sides of the pan. That's right. I'm working that damp pastry brush today. Getting darker. Note the small 'crusties' forming at the edge of the pan. Scrape those off and stir them into the mixture. If you have crusties sticking to your spoon, rinse them off. Remove the pot from the heat. You can add vanilla at this time, being careful as it will bubble up. Mind the steam when adding the vanilla. Now we're going to beat the mixture to encourage proper crystallization. Grab your wooden spoon and mix vigorously. For at least 10 minutes. This is going to make your arm very, very sore, but if you're eating this tablet you're going to need the burn because you're dealing with about 9000 calories (really) in this pot. Beat this for 10 minutes. The mixture is going to start smooth and creamy, like a thin caramel sauce. After mixing it for about 5 minutes you'll notice that it is thicker and the glossy shine has a bit of a texture to it (this is the small crystallization you're looking for). If you look closely you'll see it. Like a caramel sauce with a very very fine grit (think: mini hourglass sand). Continue to mix, until the mixture has thickened and cooled slightly but is still pourable. Pour the mixture into your prepared pan. Smooth the surface and remove any air bubbles by tapping the pan on the counter top a few times. Allow to cool for several hours before cutting (or scoring so you can break it later). Fresh cut tablet. Not as dry as the Edinburgh stuff, but the texture is spot on. The tablet I had in Edinburgh was a bit drier than this fresh made batch, but that seemed reasonable since the Edinburgh tablet had been sitting out for a who knows how long. This tablet, after sitting in a jar for four days, is developing the exact same texture as the store bought stuff. A light crumble, dense, moist, slight grain and a rich butterscotch. My granny makes what I would argue to be the BEST tablet ever. She's been making it for so long that she does it all by eye, no thermometers, no nothing. Typo: pastry burgh - I actually googled to find out whether you'd acquired some new Scottish tool to go along with the Scottish tablet...alas, no. Gosh you guys are fast. I usually proof once it is live, it is awful hard to read these long post in those narrow blogger windows. I'm proofing and editing now, so forgive any initial stupidity. As for me being quiet, I've been piling up the illnesses lately. It seems like the best welcome home Seattle can give me is a handful of viruses. the tablet looks wonderful...thank you for doing all the work for all of us! I'm probably not going to list which three pies I'm baking. can't wait for more pies. You really are the Goddess of Sugar - I LOVE YOU! It looks really good Ms. H. If you keep it just a little while, those edges will dry and crumble, and my goodness. Heaven will at once be on Earth. Thanks for the step by step instructions and photos! wow, you NEVER cease to amaze me...thanks! These remind me of old-fashioned candies you hardly ever see anymore. And I love anything that's butterscotch. Kudos to you for recreating one of your favorites. Oh my! I've never had this, but from the ingredients and the description, this is something I would love! Thank you for posting step-by-step photos and your cooking notes. That's a leap from the 3-line instructions you had to learn from! I've never seen or eaten this, it looks addictive! You just reminded me that candy making is no easy feat. My piano teacher growing up was from Scotland and every Christmas she would give us a tin of tablet. It was like crack! It's always had a special place in my heart, and I appreciate your detailed post about how to make it. I'm going to give it a go! This looks wonderful!!! And time consuming... for me this may be something to take one when someone is available to watch my little man (5 month old son)! Well Ms Humble, this Scots lass owes you a debt of thanks. I've tried and failed on many an occasion to make tablet. It was either soft and gooey like fudge or it was brittle and aerated like puff candy. So when I saw your recipe, I had to give it a shot. I made it last night and although my technique needs fine tuning, it was my best ever attempt at the Tablet I know and love. My colleagues at work couldn't get enough. It's divine. So thank you for teaching me how...finally! I am extremely impressed! Having eaten and made a lot of tablet over the years, I have developed quite an aversion to the grainy stuff, and you seem to have achieved the perfect texture. The photos are really helpful also. I'll be keeping this on hand during our annual tablet-making this Christmas. Thanks! I've never heard of tablet. I really want to try this now. Looks great! saw this on boingboing and thought of you! Oh this book is so cool! I get the feeling I'll be reading it cover to cover. 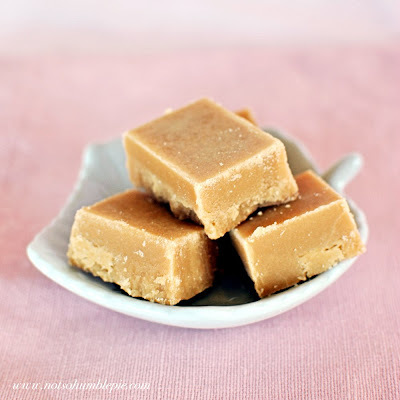 Seeing a scottish tablet recipe made me smile. In fact, I have to say it's the first time I've come across it from all the food blogs I read. My Nana made this every year for Christmas (her recipe is different to yours and you can see it on my blog if you are interested) and doesn't use cream. Could we add some whisky to this recipe, Miss Humble? Truly Ross's Edinburgh whisky fudge style? While I haven't tested it myself yet, yes you should be able to. I'm going to be conservative and recommend 3 tablespoons of whiskey (add it at the same point you would add the vanilla). Though you can probably get away with adding a bit more. My Scottish co-worker just gave me a lovely gift of treats which included a couple of bars of Luxury Tablet from the Wee Tartan Confectionery. The list of ingredients on it is: Sugar, condensed milk, water, butter, glucose, and dried skimmed milk. So I guess adding glucose isn't as sacrilegious as you'd think. I'm doing a British tea weekend for friends of mine here in Berlin and, wanting to do something sweet from each of the 4 nations, had been looking for a table recipe - this looks like a great one to try out! I have just one question - do you think it would be possible to use half the amount of all the ingredients? I just looked in the kitchen and we don't have an 8qt pot! Dividing candy recipes can be tricky as it adjusts the cooking time (the sugar syrup can concentrate quicker). If you're comfortable with candy making then yes, you can divide it. However, you can use a 5-6qt pot or dutch oven. Higher sides makes it easier to manage in the last stage of beating the candy, but it certainly won't boil out of a 6qt pot. I'm not so experienced in candy (more of a cake person myself) and so I guess that getting hold of a bigger pot! The Scottish Tablet was are new find when we went to Scotland. Now to try and recreate this sweet delight via your recipe and suggestions. This is something people at my work would love, I am going to have to give this a go. I made this last week for an actual Scottish friend who missed his mom's cooking, and he pronounced it "just like his mom used to make." Thank you so much for your great directions. All the other tablet recipes I found were so hard to follow. Yours apparently, is perfect! My mother used to make a similar candy when I was a child. No one has a recipe. I am of Spanish descent, so I think that's where the recipe originated. Tablet is close, but hers was a little darker and had a stronger carmalized sugar taste. Any suggestions for alterations to the Tablet recipe to try and achieve this? You could try dry caramelizing a portion of the sugar before adding the remaining sugar and wet ingredients. This would darken the color and give the candy a stronger caramelized sugar taste. There are other ways to achieve this, but with this recipe/method this is likely the simplest.